In my case, I have an organisation chart with nodes, which allows the user to connect the nodes visually. A way I solved it so far is have a “link” icon on each node, when the user presses it they switch to “link mode” — an on-screen line starts at the origin node and follows the mouse cursor, until the user clicks on another node (or right-clicks / presses Escape to exit the link mode). So how do I draw that line between arbitrary points A and B on the webpage? The answer: Just draw it and rotate it. Warning — details below may contain traces of math, please be careful if you're allergic to it. Though its density is so low that it is unlikely to hurt anybody, honest! First of all we need to establish that HTML blocks are rectangles. So the original line will be a rectangle of desired length and width. Since it will be rotated, length is a calculated value. This is a 3-pixel-wide rectangle with no height set. Height will be the length of the link line, so to complete the task we need to determine its length and the rotation angle. As you can see from above, we're dealing with a so called “right triangle”, and it is very easy to calculate various lengths / widths / angles for it knowing what we know — namely, the coordinates of the points A and B. Our link line is the green side. I assume that top and left properties of the #new-link-line are already set to correct values — it would be inefficient to do that on every mouse move. This code should be inserted into the linkMouseMoveEvent function. Note that both binds are to events with “.link” suffix — this allows to easily unbind them when needed, not touching the other potential handlers of the same events. 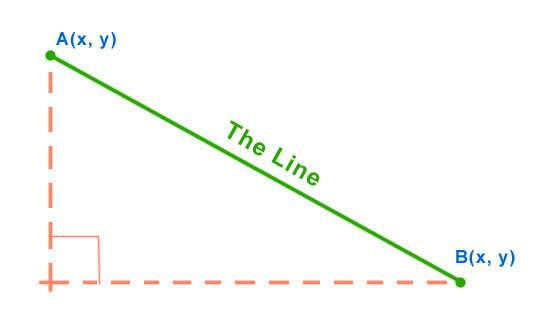 This approach allows to even set shadows and borders to the line. One downside is that it won't work below IE9 — so you may need to look for alternatives if your environment forces you to support things like IE8 (about 11% of total Internet population, so could be important in some cases). ​Quite a lot of code in this post, please let me know if I got anything wrong — or if it can be done better! Great work! Any ideas on how this could be extended to "targets" too? Say e.g. if you wanted to do a game for children that pairs together some animals and some fruits (by drawing lines between them). How are you going to make it work in IE8? Yes, it is a good question, and I haven't looked for a solution yet — CSS3 transforms don't work there, yet I did see mentions of filters which could allow rotating an element. I will post an update if I find a working solution. Is there any way to stop a line without removing it?? i was trying to implement the Anton Maslo example but i cannot reach the target, i would like to stop the line as soon as i click on another div so the line shd be link both without removing. If I understand your question correctly, then you just need to do something instead of removing the line — perhaps create a connector line (instead of #new-link-line, in case you need to reuse it), or just leave it be. Looks great, Aaron, thanks for the feedback! Hey this is cool. Thanks for sharing. I am working on similar thing. I want to generate diagonal line as I scroll my page. I dont want to use mouse event. Can you please help me with this. Thanks in advance. Thanks for the kinds words. I don't really understand what you try to achieve, so can't really help, sorry. There are scroll events that you can hook into, if that is what you need. Awesome, helped me a lot. Thank you. Also, I think the variable newLinkStartTop is confusing, as it's never defined anywhere in this explanation. in the jsFiddle, it's using origin, as it should. Just wanted to point this out. But thank you again for this demonstration, it's proving very helpful for my current project! Hi Corey, thank you so much for your attentive feedback — I've corrected both issues, really appreciate you helping me improve this post! Fixed the “click” button demo, looks like last corrections to the post re-formatted some of the included JS code. Hey there, thank you so much for this example! It helped me get through one part of a project I'm working on. I fiddled around a bit with it to make it do the "connected" behavior I was aiming for. Hi Elliot, I am really glad I could be of service, and cool to see what you did with the fiddle, good job! Hey Anton, nice Tutorial u have there!! But i have some Problems wheni try to implement in a own website, what references i have to link in my html file? because it isnt working for me. Nice One Anton. This is what i wanted. The mousemove event won't get unbinded in the endLinkMode() bcoz its isn't binded by bind(). You're correct, it won't unbind, especially since I use the .link suffix in unbind call. Well spotted! This only relates to the JSFiddle code, though, since I don't include any of the endLinkMode login in this article.